A place where life and worship intersect for all ages, The River will be life-giving and quench our spiritual thirst! Come to The River, Sundays, 6 p.m.
Worship at Zion – What Can You Expect? If you visit on Saturday night at the 5 p.m. worship service you will experience a traditional Lutheran service order. This means the service will be centered in hymns (songs) led by the pipe organ, with Lutheran liturgy (service order prayers, singing and spoken dialog). One or two lessons will be read from the Bible and the pastor leading the service will preach for 10-12 minutes on one of the lessons. Another hymn follows the sermon (the pastor’s talk) and then prayers and offering. Then the service turns to Holy Communion, all are invited to come for bread and wine where Jesus is present for you. A closing hymn is sung and the service concludes by 6 p.m. A few of the worshipers remain after to visit, but most depart right away for their own evening activities. On Sunday morning, the 8 and 9 a.m. worship services are the same order as the 5 p.m. service, following the traditional Lutheran service order with hymns, liturgy and Holy Communion. On Sunday mornings, one of Zion’s choirs will also be a part of the service. The 8 a.m. service attendance is like Saturday night, worshiping around 125-150. The 9 a.m. service is the largest of the weekend worship services, which brings a bit more energy into the service. September through May Adult Learning is offered at 9 a.m., led by one of Zion’s Pastors. 10 a.m. is Zion’s learning hour for all ages. This is when Kid City (Sunday School), Confirmation classes for 6-8th graders, the High School Youth Forum and the Adult Study all meet. The Zion faith community is committed to worshiping as the whole family of God and then learning together at a separate time. It is a commitment, but the long-term blessings for faith formation make this the model to follow for all ages. So, worship at 9 a.m. and learn at 10 a.m., or learn at 10 a.m. and then worship at 11 a.m.
At the 11:00 a.m. worship service the style shifts to a more informal, blended/contemporary service. A screen is used where the words for the service order and all the songs are projected. The service is led by a worship team, with piano, guitar, drums and singers, in contrast to the earlier services led by the historic Zion pipe organ. Holy Communion is celebrated at this service, each week, as well. This is Zion’s fastest growing service. This service concludes before 12 noon. On Sunday evenings at 6 p.m., The River worship service uses a liturgy based on ancient patterns and rituals, a rich fare for mind, body and soul. It is ecumenical yet with a distinctive Lutheran flavor, infused with inclusive language and expansive images for God. The service is multisensory, the liturgy is contemplative, and sermons are relevant to contemporary issues and struggles. A variety of styles of music are used throughout this service, ranging from traditional hymns done in a reimagined way to sacred songs written recently. Holy Communion is celebrated by intinction (dipping). This is Zion’s newest worship service and it is our hope that The River will be life-giving like the waters of baptism and the rivers that intersect in our community. The 6:30 p.m. Wednesday Summer Cabin Worship helps you keep connected if you know you will be gone for the weekend during the summer months. The service runs about a half an hour and the order of service contains the same scriptures, songs and sermon as the worship services for the upcoming weekend. Here at Zion an open altar table is celebrated, which means that you are invited to take communion at Zion. All guests, visitors and members are welcome to be a part of God’s gift of love and forgiveness in the bread and wine. (Gluten free bread is offered, as well as grape juice, for those who prefer or need that option). Children are welcome! More than welcome, children are meant to worship with their parents each week in worship. A children’s message is shared at the 9 & 11 a.m. services and Holy Communion is open to all ages of children. 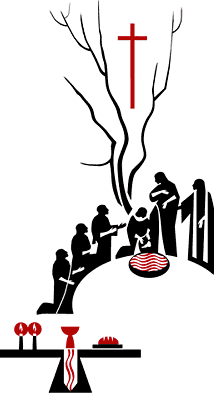 All are welcome to a time of quiet reflection and contemplative prayer the second Sunday of each month at 5 p.m. in the Chapel. Newcomers are always welcome!